The Interstate lays claim to more than 50 best-in-class features that make it the superlative Class B RV. In the Interstate, you’ll find more than 50 best-in-class performance, safety, and design features. And they all come standard. The luxurious UltraLeather™ seating surfaces? Standard. The residential-style cabinetry made with wood imported from Italy? Standard. The advanced Mercedes-Benz safety features? Standard, of course. 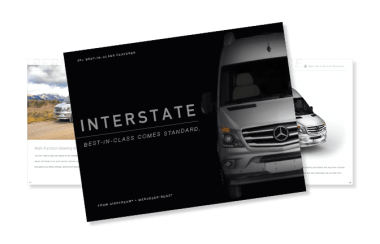 Learn more about all the Interstate’s best-in-class features by filling out the form on the Airstream site to receive your guide.